The DeArmond guitar pickup models 6811 and 6812, also known as Four-scroll or Moustache grille, are one of the group of guitar pickups with adjustable poles which includes the S-grille and D or Diamond grille pickups, factory-fitted to many instruments produced by CMI. Model 6812 underside. Pickup DC resistance 7.61 KΩ; Coil Inductance 3.65 H; Poles’ magnetic Polarity N.
These pickups were fitted in many Harmony guitars, always with a white bezel. Though their appearance suggests otherwise, they are surface-mounting pickups. A small hole is sometimes drilled under the pickup allowing the cable to enter the guitar’s body. 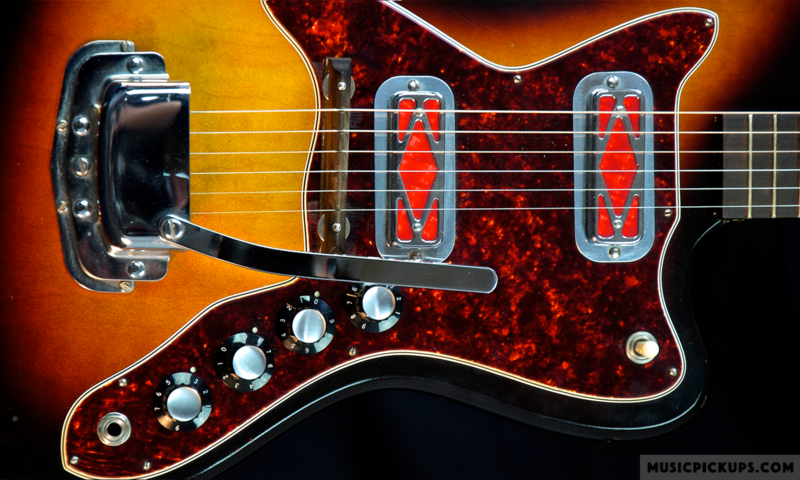 There is also a small cut-out in one side of the bezel, seen in both photos above, as an alternative cable exit, used when the cable is hidden under the pickguard and brought through the instrument’s F-hole. Both models appear the same when viewed from above. Viewed from below, both pickups show a slotted steel plate riveted to the pickup head. The plate is secured to the bezel by means of two Philips-head semi-countersunk setscrews. Viewed from below however, there are two different fixing arrangements. With Model 6811, these two screws, if loosened enough, may be completely removed, causing the pickup head to fall free of the bezel. With Model 6812 above, these same two setscrews are drilled transversely and a split pin is fitted in each. This allows the pickup to have a height adjustment of approx. 1/10″ (2.5 mm.) while keeping the assembly in place. The bezels were manufactured in a range of depths to suit individual instruments. The bottom of the pickup bezel is either flat or slightly concave on its long side, to allow for an archtop’s body contours. A black version of the bezel is used with an S-grille gold foil soapbar in the Harmony Mandolin H35.